Hi friends! It's hard to believe just a week ago, we were witnessing snow in New Orleans. In my 13 trips to the Big Easy, snow was never something I thought we would experience. 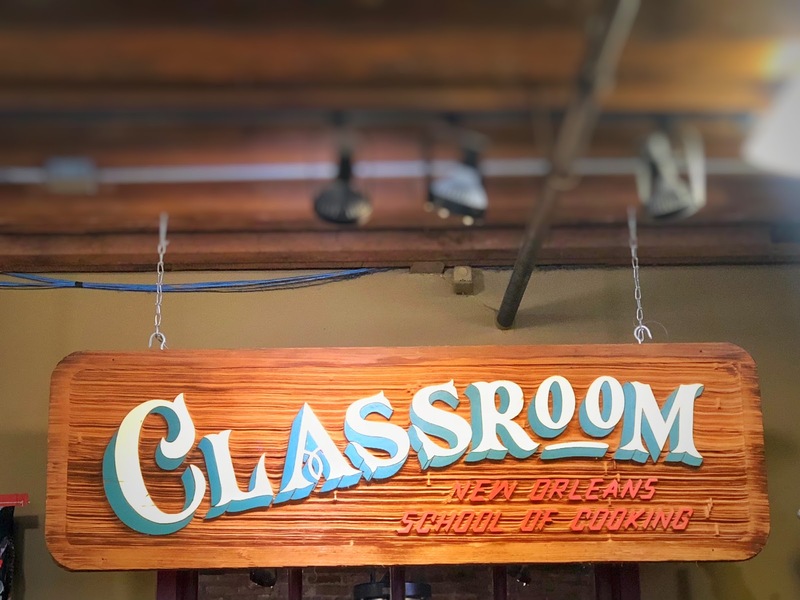 While we didn't get to do everything planned during this trip due to the weather, we did get to check out New Orleans School of Cooking, something I have wanted to do for years now. 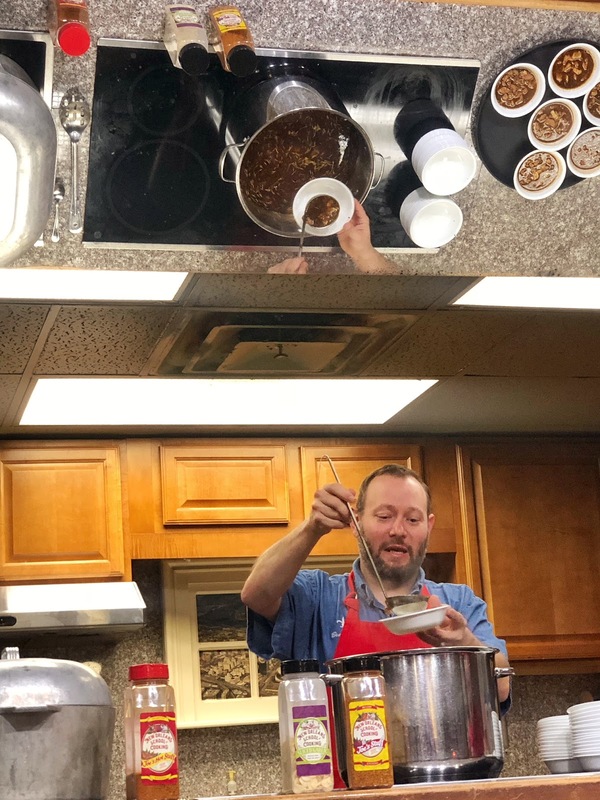 My husband Gabe and I signed up for the New Orleans School of Cooking morning demo class and learned how to make Gumbo, Jambalaya, Bread Pudding and Pralines. They menu varies day to day and they also offer hands on classes which we will be booking on our next visit. Prior to this class, we've made Gumbo a few times but it came out looking too light. 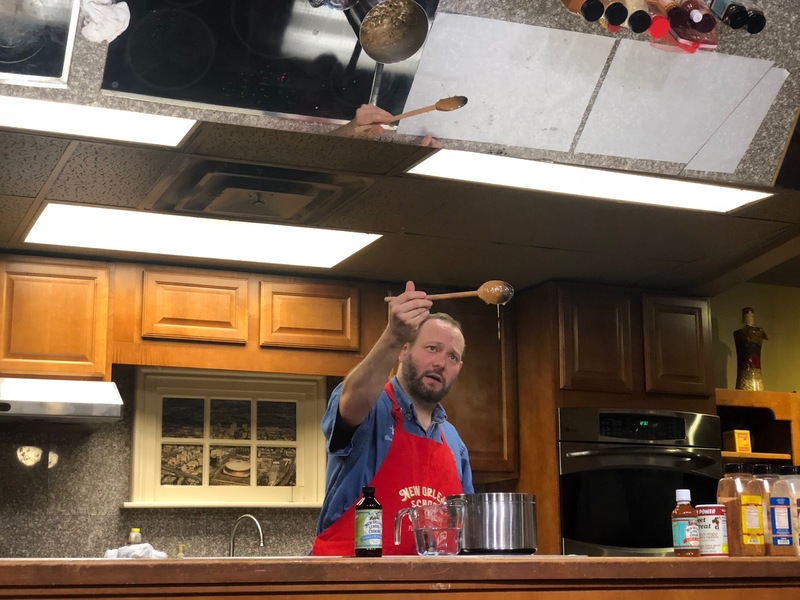 I learned why during this class, I didn't cook my roux nearly long enough! We also learned a trick to make quick roux - cook it in a cast iron skillet and get your oil or lard hot (be sure to use a oil suitable for high heat such as Canola) and gradually add your flour, stirring constantly. Bring your roux one color darker than you want to serve it, pull it off the heat and add your trinity then. The trinity will stop the cooking process. When it came time for us to eat the gumbo, both Gabe and I went back thirds. It was that good. 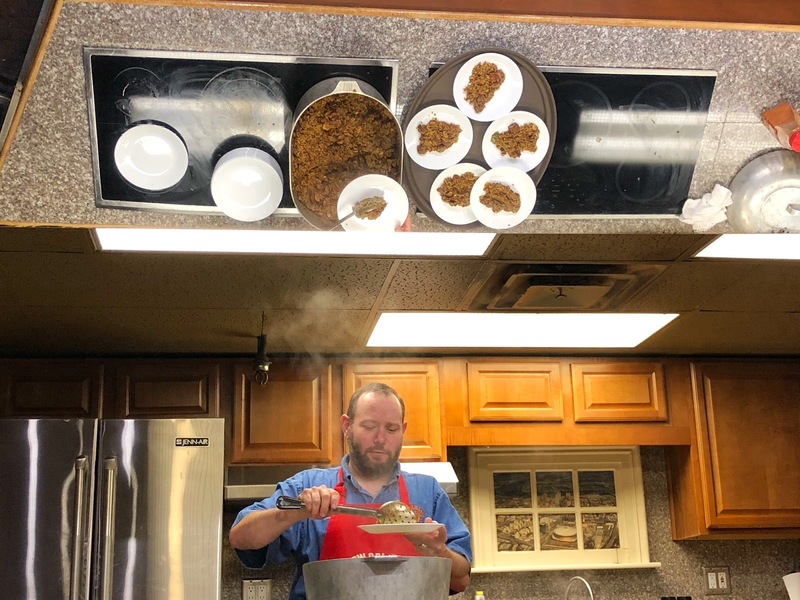 While we were eating, Chef Brandon showed us how to make Jambalaya. We've made jambalaya a few times and it always turns out too mushy. Come to find out, you are not supposed to use white rice and you need to use parboiled rice. 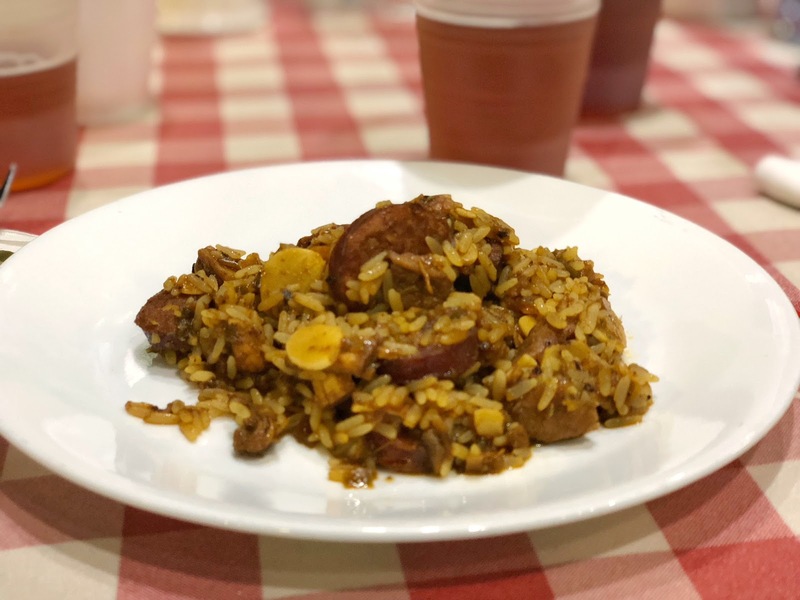 Once again, we were wowed by the flavor and Gabe said it was the best Jambalaya he's ever had. While we were eating Jambalaya, each table received a pitcher of Abita Amber. It was the perfect companion to the delicious creole food we were eating while learning how to cook it. 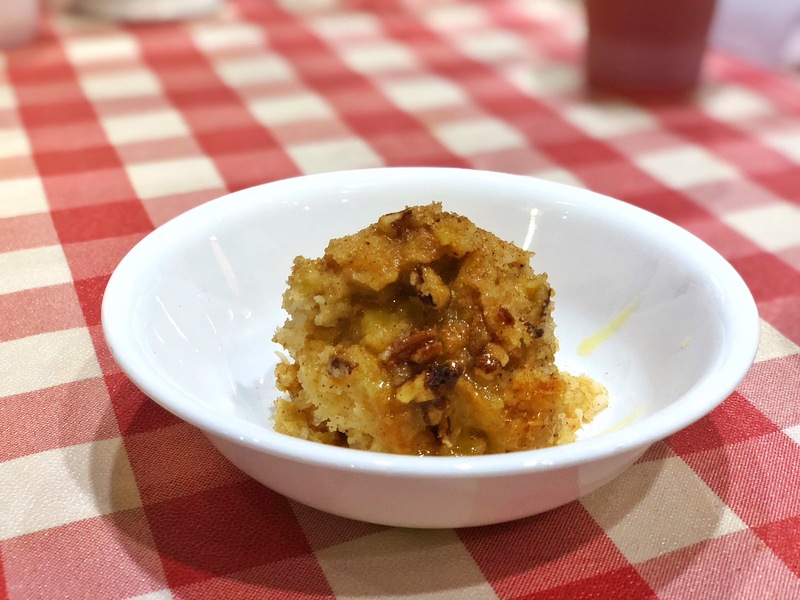 Next up was the Bread Pudding. This was actually prepared and put into the oven prior to us getting there. However, we brought home the recipe and it was delicious! Finally, Pralines. This is something I will never try to cook from home, although Chef Brandon made it look extremely simple. Overall, this was a great experience. We learned some New Orleans history that even we haven't heard before, such as New Orleans has the second most rice fields in the US and 99% of their crawfish come from those fields! I would strongly encourage anyone visiting New Orleans, who wants to bring home skills to make creole staples at home to give this a try. I put it up in our top three experiences we have done in NOLA. Make this for Christmas! 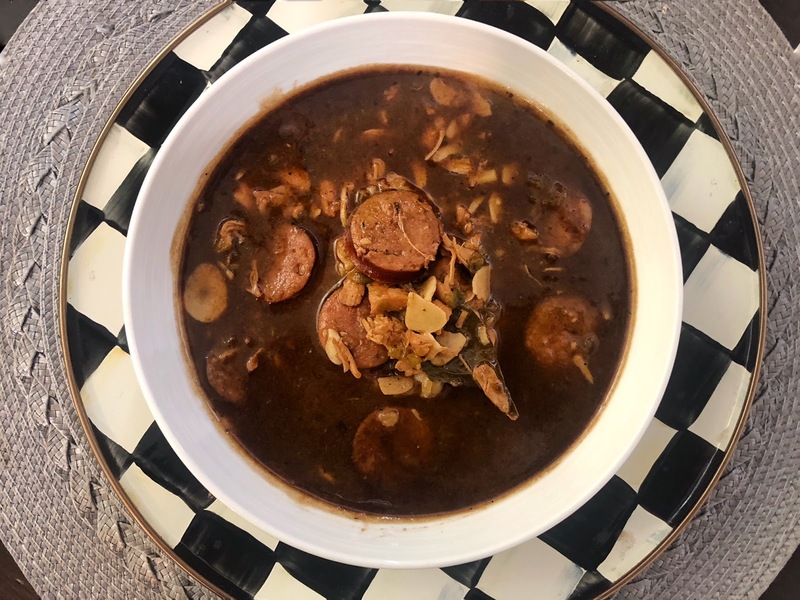 We've been home for almost a week and have already made Gumbo..... and it was a huge success!!!! This was super easy and it was delicious. During the class, we learned that Gumbo is commonly served during Christmas dinner. Just add some seafood for an amazing seafood gumbo a few minutes before you are ready to serve. Saute the chicken in a large pot using oil, lard or bacon drippings (I used oil). Add the sausage and saute with the chicken. Making the Roux: In a Cast Iron Skillet heat your oil over med-high heat. Once hot, gradually add your flour and stir constantly. Once you get to your desired color (ours was between dark chocolate and coffee), pull it off the heat and add your Trinity (onion, celery, pepper) which will stop the cooking process. Stir constantly until your veggies have reached desired tenderness. This will appear burnt but it likely isn't (unless you smell burning, then you need to restart). Add your Roux to your large pot of sausage and chicken, stirring constantly. Stir in your chicken broth, bring to a boil and reduce to simmer for at least an hour. The longer it cooks, the better it will taste. Season your Gumbo to taste using Creole seasoning. We used a brand from the New Orleans School of Cooking called Joe's Stuff which you can find on New Orleans School of Cooking website or on Amazon. While that isn't widely available, you can also use brands found nationwide such as Tony Chachere's (which I grew up on). Serve over a little rice - not too much as the star here is the gumbo, not the rice. 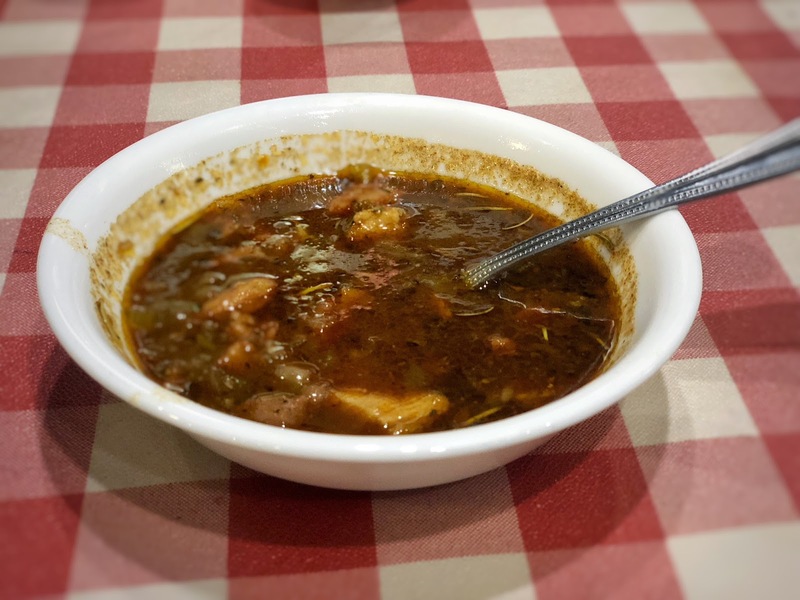 Make sure you have a loaf of french bread because you will need it to soak up the Gumbo! A few side dish suggestions are sweet potatoes or potato salad (or of course a nice salad).